The cold, short days of winter are quickly falling behind us, so it’s time to make sure you’re ready for the warmer weather of summer! At Basu Aesthetics + Plastic Surgery, we could not be more excited to fully embrace the sunnier days at our new location in Towne Lake. To celebrate the opening of our new location at 9899 Towne Lake Parkway in Cypress and introduce ourselves to the area, we’re giving away two (2) free CoolSculpting® treatment cycles to a lucky winner! To enter, simply fill out the form. Entries will be accepted until April 22. Say hi to summer thighs and leave the stubborn fat in the cold with America’s most popular, noninvasive fat-freezing treatment. 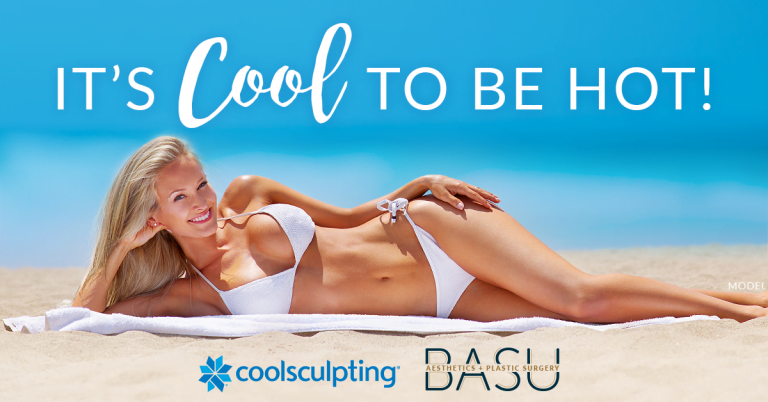 See some of the real patients who experienced #TheBasuDifference of CoolSculpting here. For anyone who is deemed to not be a suitable candidate for Coolsculpting after a consultation with Dr. Basu, we are proud to be Houston’s newest provider of InMode Aesthetic Solutions’ BodyTite® and FaceTite® treatments. These minimally-invasive body contouring procedures are for patients looking to achieve surgical-quality results, without the downtime or scarring of traditional surgery. They are a great alternative for anyone thinking about liposuction or facelift procedures! Stay tuned on our Facebook and Instagram pages for promotional news and updates on our new Cypress location, as well as the winner announcements! Good luck, and enjoy the warmer days upon us.